Wunzi System – for infants and young preschoolers. Full Body System (FBS) – comes with limb strapping components. For young children with FPA deviations accompanied by neuromotor disorders such as cerebral palsy, spina bifida, or cerebellar ataxia, TheraTogs Tank Top and Hipster are both needed for optimizing postural alignment and control as a foundation for improving limb use. The essential elements in achieving bone modeling to reduce excessive intoeing will be: corrected foot joint alignment; training to gain full weight loading on the heels; and competent weight shifts onto the stance side so that the swing limb can impose more appropriate rotation forces on the stance limb. 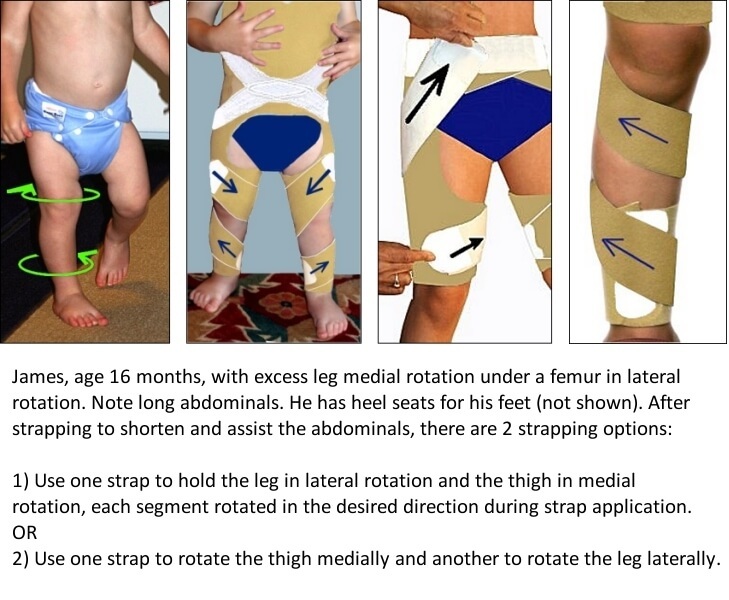 Young children with an intact CNS who exhibit intoeing due to modeling errors in the femur and/or leg bones, or due to knee joint laxity, should be able to wear the TheraTogs Hipster only, with a TogRite strap attached to help to shorten and assist the lower abdominal muscles while the child is in training to carry his or her body weight back on the heels as well as the forefeet. With foot alignment and the lower trunk addressed, rotation straps are applied to the targeted limb segments in the direction of correction. How can TheraTogs be used to reduce intoeing and out-toeing? Movement-Related Bone and Joint Modeling – changing bone shape through the forces imposed by use history – occurs during growth. (See also physiologic adaptation.) As the pliability of growing bones and joints diminishes during childhood, so does the opportunity to influence developing bone and joint shape. Until research shows otherwise, we do not advocate attempting to correct FPA problems due to bone torsion with daily rotation strapping applications after age 6 years. Before finding the musculoskeletal source(s) of the FPA deviation, the first step in intervening is to evaluate and address any faults in foot and ankle alignment or mobility by providing appropriate orthoses. Foot malalignments can feed FPA problems. The potential for TheraTogs to affect growing bones by improving functioning joint alignment throughout the day is related to the maturity of the bones and to the nature of daily movement activity. TheraTogs strapping is used to gently correct functioning pelvic and limb alignment all day. Therefore, it is essential that the source(s) of deviations in FPA be identified with a careful musculoskeletal evaluation. Contributing factors include one or more of these components: hip rotation, femoral torsion (twist), knee joint laxity allowing leg rotation, tibiofibular torsion, inward rotation of the talus inside the ankle joint, inward deviation of the long bones of the forefoot (metatarsus adductus), or outward deviation of the forefeet due to pronation (midfoot collapse). A key element of normal bone and joint development – and related walking patterns – is the ability to manage body weight effectively. An important factor in that ability is the biomechanics of functioning bone and joint alignment. They are interconnected. Intoeing reduces functioning foot length, encouraging a forward acceleration of the body center of mass at a time when the large immature foot is needed in front of the body to help to develop balance against falling forward while learning to walk. (Try walking with your feet turned inward. You will feel your weight carried too far forward, and will prefer to jog than walk.) A trained clinician can also find evidence of pathologic intoeing by detecting stiffness in hamstring and calf muscles – due to excessive recruitment of these muscles for balance. Out-toeing interferes with walking efficiency by restricting step length, imposing persistent foot pronation through the stance phase of gait, and by disabling the lever mechanism of the foot at propulsion. Turner et al (1981) obtained and analyzed 1672 measurements of tibiofibular torsion using a tropometer from 836 patients in 11 diagnostic categories of knee joint pain or dysfunction. While patients with patellofemoral instability and patellofemoral chondromalacia had a significant increase in lateral tibiofibular torsion, the most important finding was a significant reduction in this torsion in patients with panarticular knee joint diseases that prompted a visit to the knee clinic. Children with “symptomatic intoeing gait” have characteristic primary and compensatory kinematic gait deviations that result in increased loading about the knee during the stance phase. In addition to problems such as frequent tripping and falling, they might complain of pain in the knee, foot, or ankle. Legs & Feet: A Review of Musculoskeletal Assessments – a DVD of Beverly Cusick demonstrating 30 musculoskeletal assessment procedures- is available at the Progressive GaitWays website. Mallau S, Mesure S, Viehweger E, et al. 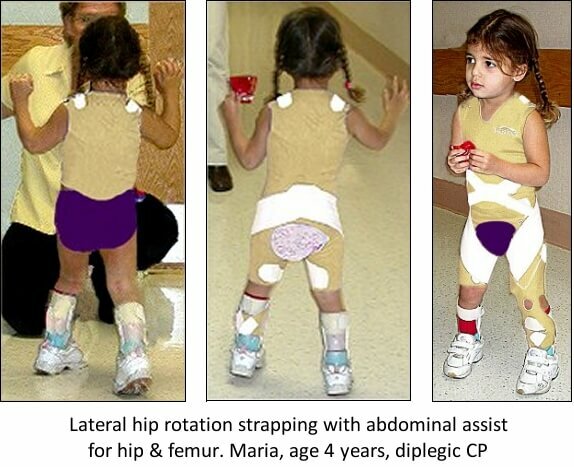 2008.Locomotor skills and balance strategies in children with internal rotations of the lower limbs. J Orthop Res. 26(1):117-25. Takai S, Sakakida K, et al ( 1985) Rotational alignment of the lower limb in osteoarthritis of the knee, p. 209. Int Orthop. 9(3):209-15. Yagi T, Sasaki T. 1986.Tibial torsion in patients with medial-type osteoarthritic knee. Clin Orthop Relat Res. (213):177-82. Turner MS, Smillie IS.1981. The effect of tibial torsion of the pathology of the knee. J Bone Joint Surg Br.;63-B(3):396-8. Davids JR, Davis RB, Jameson LC, et al. 2014. Surgical Management of Persistent Intoeing Gait Due to Increased Internal Tibial Torsion in Children. J Pediatr Orthop. 2014 Feb 13.